Why were these colonies founded? · Delaware- intended to trade with local Indians. · Pennsylvania- to create a colony that allowed for freedom of religion. 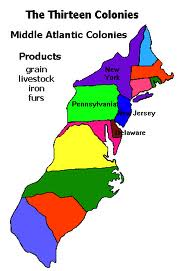 · New Jersey- for farming and trade. What role did religion play? Religion didn’t play much of a role, but Quakers, Catholics, Jews, Lutherans and Presbyterians were religions with the most numbers. What were the economic conditions? They enjoyed a successful and diverse economy, many jobs were important in keeping the economy running well, such as: Logging, shipbuilding, textiles production, and papermaking. What were the geographical characteristics? Delaware- water covers 2/3 the coast of Delaware, has over 50 freshwater lakes and ponds, and nearly all of Delaware is on the water. Pennsylvania- very hilly, excellent soil for agriculture, and there were harsh winters. New Jersey- very rocky, rich virgin soil, and the winters were typically cold and summers are hot and timid. · Geography ranged from coastal plains along the coastline, piedmont in the middle, and mountains farther inland. · These colonies were known as the “breadbasket” because of the large amounts of barley, wheat, oats, and rye that were grown here.